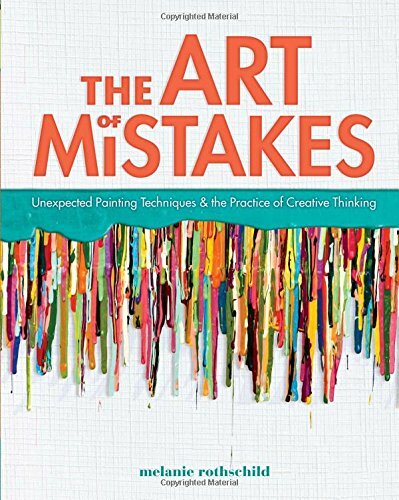 The Art of Mistakes is a motivational book by Melanie Rothschild that talks about dealing with artist mistakes and creative thinking. Much of it is internalised, meaning it's more about learning from your own mistakes and accepting who you are rather than getting bothered by the critiques of others. Overall, the writeup is actually quite short though. Half the book is on the motivational stuff. And half of that motivational stuff are actually full pages of pull out quotes from the opposite page in huge font sizes. Second half of the book is more hands on. Rothschild presents several step by step tutorials on how to create several artworks. These artworks are actually patterns and shapes. Not sure if you have heard of the Print and Pattern book series, but the artworks here look like those. This is a book more suitable for those who are self critical. Perhaps you can learn from the author's personal experience, or get a new frame of mind, or try out the tips to become more creative. A Kindle version of the book is also available. I would recommend that instead because the book has a lot of text. And the pictures included are mostly installation art. It will be good if you can read it on a colour screen though.